Providing you the best range of pin bush coupling, rubber diaphragms coupling, rubber spider coupling l75 and rubber tyre coupling with effective & timely delivery. We have marked a distinct position in the market by providing a high quality range of Pin Bush Coupling. This coupling is manufactured using high grade material and advanced technology in conformity with set industry norms. 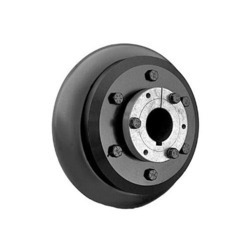 The offered coupling is available in various specifications to meet precise needs of our valued clients. In order to make sure its high quality, we check this coupling on various quality parameters. We introduce ourselves as the leading organization, engaged in offering a wide assortment of Rubber Diaphragms Coupling. These diaphragms are manufactured using high quality rubber and highly developed technology. Further, these diaphragms are checked on various quality parameters by our quality controllers. Extensively demanded in the industry, these diaphragms are available in various sizes and designs as per the requirements of clients at market leading price. We are instrumental in providing our clients with a comprehensive range of Rubber Spider Coupling. This coupling is designed and manufactured using quality approved rubber and sophisticated technology. Manufactured in line with international quality standards, this coupling is available in various sizes as per the specific requirements of clients. Also, this coupling is checked on diverse quality parameters, which make sure it’s perfect finish. We offer this coupling at pocket pleasant price to the clients. Size 1" 32mm or 1 1/4"